Priya Ganguli, a Ph.D. candidate in the Earth and Planetary Sciences Department, has received a 2012 Switzer Environmental Fellowship, one of the nation's most prestigious academic awards for environmental leaders. This year's Switzer Fellows, 20 in all, were chosen from universities in California and New England. Fellows are awarded $15,000 each to complete master's and doctoral degrees to advance their skills and develop their expertise to address critical environmental challenges. Ganguli is studying mercury contamination in coastal groundwater and the ocean. She is also interested in terrestrial watershed dynamics and has been involved in several mine-site remediation projects in the California Coast Ranges. For her master's degree research at UCSC, she studied mercury transport and cycling at the abandoned New Idria Mercury Mine, which is now an EPA superfund site. 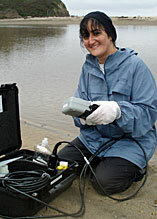 After completing her M.S., Ganguli worked as a geologist at the San Francisco Bay Regional Water Quality Control Board, where she worked on large-scale mine-site and wetland remediation projects. She also gained experience in environmental regulatory permitting at a number of industrial sites, including chemical plants, refineries, tank facilities, and landfills. Ganguli said she would like to combine her background in science and policy to continue working on multidisciplinary environmental restoration projects. For her Ph.D. research, Ganguli is investigating mercury transformations at the land-sea margin, with a focus on quantifying the form and mass of mercury discharged to the ocean via coastal groundwater. She is also exploring the interaction between barrier beach lagoon surface water and coastal groundwater to determine how seasonal changes in water quality may influence nearshore mercury cycling. This research is adding to a growing body of literature documenting the importance of groundwater as a source of mercury to marine ecosystems. Ganguli is co-supervised by Andrew Fisher, professor of Earth and planetary sciences; Russell Flegal, professor of microbiology and environmental toxicology; and Peter Swarzenski, an oceanographer with the U.S. Geological Survey. The Switzer Environmental Fellowship is a program of the Robert and Patricia Switzer Foundation that recognizes the achievements of environmental leaders and their potential to drive positive change.